Stroll by Te Mana Café on a Tuesday afternoon and you’re liable to see some of the future movers and shakers in the OB business community. 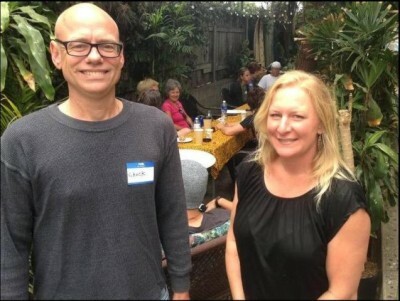 That’s where the Ocean Beach Networking Group has been meeting for a weekly luncheon ever since March. The group was the brainchild of Chuck Hardwick and C.C. Summerfield. So he took to the Internet, posting a message on LinkedIn looking for interest. That’s where he met Summerfield, a real estate agent in the area. Hardwick has taken a lead role in the group, creating a website and actively recruiting potential guests on social media. “I work from home, so I don’t really have that office setting,” Hardwick said. The meetings are informal, with the group varying in size – sometimes reaching two dozen people (full disclosure: I have attended a number of meetings, including the first one back in March). 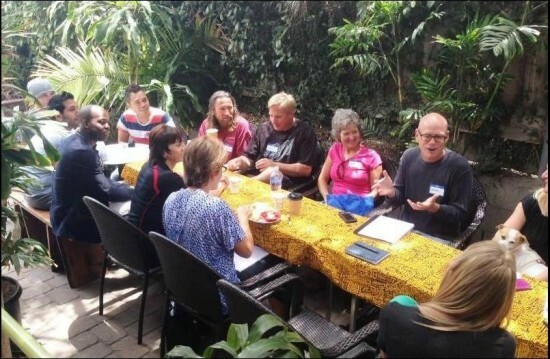 Financial planners and the occasional lawyer mingle with a gym instructor, shirt designer, drum circle leader, chef and an internet marketer who is a hypnotherapist in his spare time. 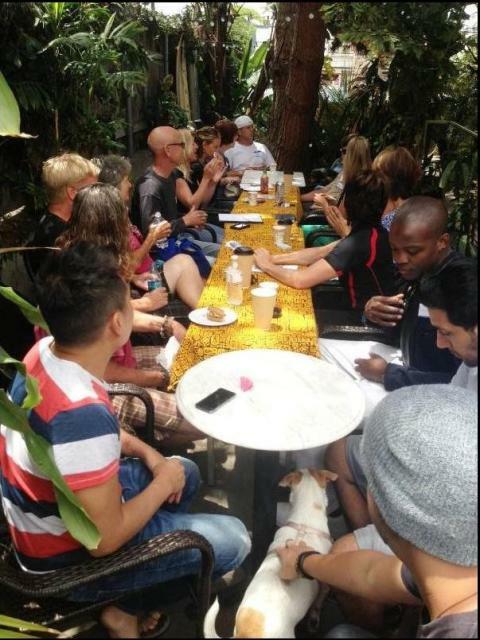 Participants meet in the patio of the Hawaiian-themed coffee shop, a rather idyllic setting for business to get done. “They’ve been so great, helping us get the word out,” Hardwick said of Te Mana. The agenda is pretty simple. Everyone at the table introduces themselves with a quick synopsis of what they do and why they are interested in the group. Hardwick mixes things up with an ice breaker, such as everyone telling the group what kind of board they ride and why (some of the choices: long, short skateboard or no board). Then a guest speaker gives a 20-minute presentation on their area of expertise, with topics varying from how to save up to buy a house to which seafood you should or shouldn’t eat. A local beer distributor was the hit of the group a few weeks back when he brought in samples for everyone to try. That’s followed by a mingling session where members are encouraged to share business cards. The founders say they’re not in it for new business, although they wouldn’t be opposed. Summerfield says it’s more of a way to bring people together who wouldn’t necessarily cross paths, even in our connected neighborhood. The group meets every Tuesday at noon. Or Hardwick encourages people who are interested to just show up.